The Mass Box helps children anticipate and appreciate Mass! Attending Mass with children isn’t easy. 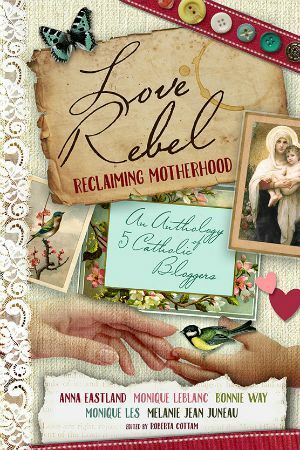 I’ve talked about that on the blog here before, and many other Catholic moms have as well. It does get a bit easier as children get older, but I’m sure every Catholic parent has heard their child whine, “Mass is boring!! 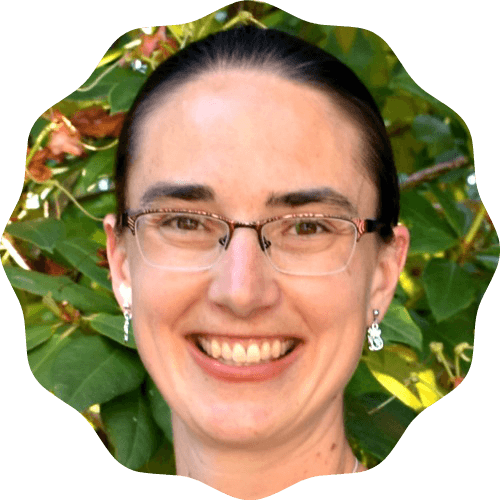 !” Over the years, we’ve tried different ways to help our children engage with and understand the Mass. Most recently, we tested out the May edition of the Mass Box. 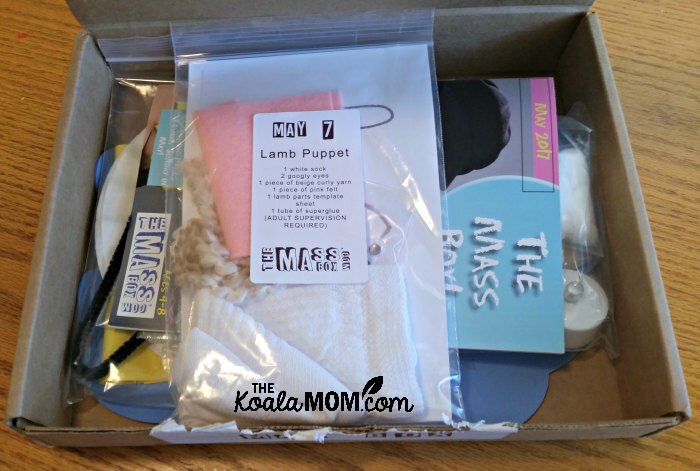 The Mass Box is a subscription box for Catholic kids. Each monthly box includes a craft for each Sunday of the month, along with a magazine-style booklet that features the Sunday readings and discussions questions and activities about those readings. Sunshine loves getting mail, so she couldn’t wait to open the Mass Box when we first got it. Unfortunately, I was down with the flu, and made her wait until I was feeling better to dig into the box. I wanted to see all the activities and fun too! What’s in each Mass Box? There were four Sundays in May, and the Mass Box had something for each Sunday. Each craft was packaged neatly in a Ziploc bag, labeled with a name and the date we were to make it for. The girls got to make a sock sheep, a bumblebee, a Ten Commandments picture, and a “Going Up to Heaven” craft. It was fun to see how these crafts made the readings in the Mass very hands-on for the kids. The magazine is thick, glossy paper, perfect for multiple kids to read or to use over and over again. Inside, we found the readings for each Sunday in May. These were followed by instructions for that week’s craft. Then there were discussions questions about the readings and activities, such as a word search, maze, and drawing or colouring page. Again, I appreciated how each activity prodded the girls to think a bit more about the readings. I actually took the magazine to Mass with us one Sunday. Lily sat quietly with a pen, drawing and doing mazes, during Mass. Having the readings in front of her, along with kid-friendly ways to reflect on those readings, helped her focus during Mass (particularly during our priest’s long homily). Who is the Mass Box for? The Mass Box is geared for children ages 4-8. Parental supervision is recommended, although Sunshine (age 9) was able to make the Sock Sheep by herself with a bit of help. 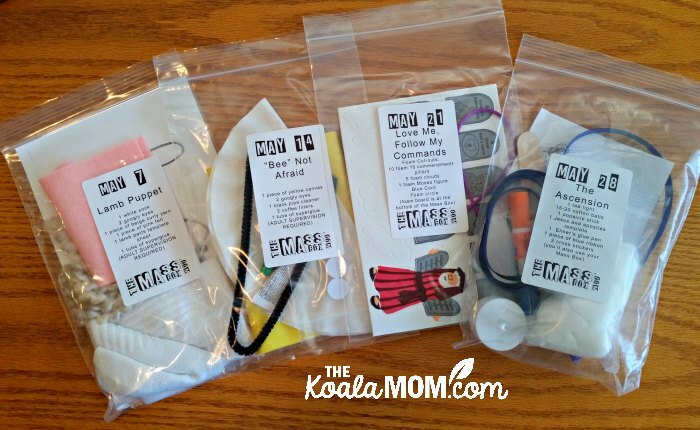 You can get a subscription box for 1, 2 or 3 kids, so your children don’t have to take turns doing the craft or share. (Although that in itself is a good lesson…) There are also webisodes to demonstrate how to make the craft. If you aren’t Catholic… the Mass Box could still be a great resource for a weekly Bible study. It’s like a weekly VBS in a box, delivered right to your door. I’ve also noticed, when attending my mom’s Lutheran church with her, that the same schedule of readings is used. If your church also follows a liturgical Bible reading schedule, you may be able to use the Mass Box to help prepare for Sunday service. I received the May 2017 Mass Box courtesy of the Mass Box; all opinions expressed are my own.